Combine first 12 ingredients in a food processor or blender; process until smooth. Transfer 1 cup to a small bowl to reserve for dipping sauce. Transfer the remainder to a zipper-top bag. Cut the pork into four strips lengthwise. Place in the zipper-top bag with the marinade, seal and refrigerate up to 4 hours, turning after 2 hours. Preheat a grill to medium-high. 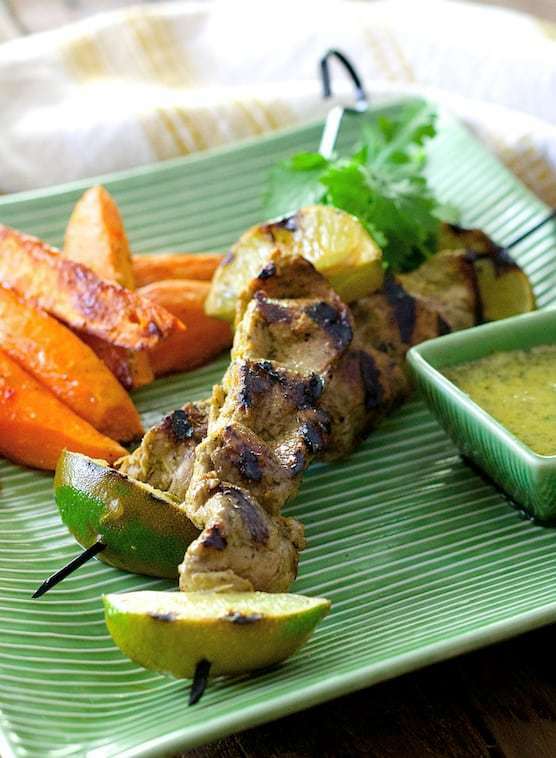 Thread a lime quarter on each of four skewers then thread pork strips onto skewers, followed by another lime wedge. Garnish with fresh cilantro sprigs. Preheat oven to 400 degrees. Line a baking sheet with heavy-duty aluminum foil. Toss potatoes with olive oil, salt and black pepper. Roast for 15 minutes. While potatoes are roasting, combine pepper jelly and vinegar in a microwave-safe bowl. Heat on medium in 15-second increments until melted and smooth. When the potatoes have roasted for 15 minutes, turn them over and pour glaze over the potatoes. Reduce heat to 375 degrees. Roast another 15-20 minutes or until potatoes are tender. After plating, drizzle with excess glaze from the baking sheet. Serve with pork skewers.